The upstairs country carriage house is a cozy, quiet home for some R&R. Reading beside the toasty gas fireplace, lounging on the back deck with a cup of coffee or hot coco and enjoying the rural mountain views from each window is quite refreshing. When you are recharged there is plenty of fun close by! Trails are 10 minutes away for hiking, biking, skiing and horseback riding. Bridger Bowl the locals favorite ski area is just 25 minutes away. Big Sky is a 45 minute jaunt. MSU, the field house and Museum of the Rockies are 5 minutes away. In 10 minutes you can be in the heart of downtown with a fine array of restaurants and shops. The Carriage House shares 10 acres with a log house to the north. 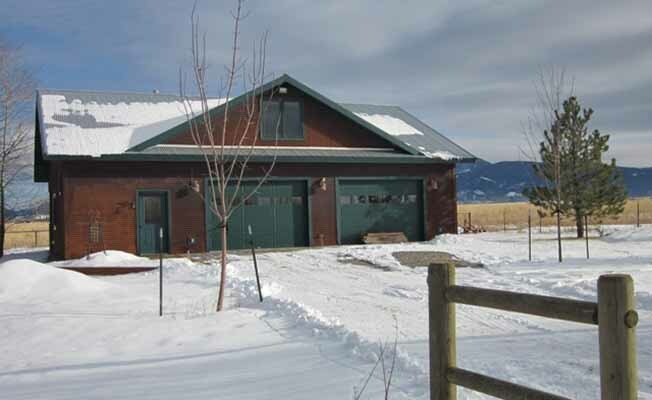 The property borders the Bozeman City limits on the popular southwest side and is accessed on one mile of gravel road. The bedroom area has a queen bed, bedside tables/cabinets and lamps. The bedroom is separated by French doors. Fine linens and down comforter keep you cozy. The living room/dining room/entry hall has two walk in closets, table and chairs for 6 diners, gas fireplace, new comfy double futon couch, several easy chairs, desk area, flat TV and DVD, games, movies and books. The bright kitchen has all new appliances; a small dishwasher, gas stove/oven and quiet refrigerator. Dishes, pots and pans, utensils, storage and staples are clean and ready to use! The spotless bathroom has a tub/shower combo, lots of cabinets, towels and paper supplies. Downstairs in the heated garage there is a washer and dryer, large utility sink and loads of secure storage room for bikes, skis and two cars or a truck. There is off street parking for one other vehicle if needed. The Bozeman Country Carriage House has great access to points of interest and activities but still has a very rural peaceful feel. You have a chance to see some wildlife, many birds and hear an occasional moo or whinny from your neighbors.